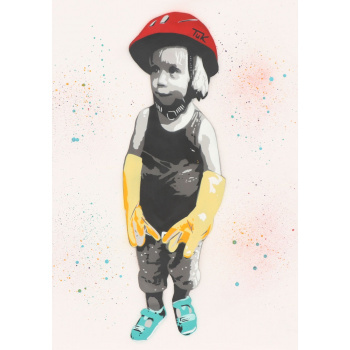 The special character about the art of Cologne-based Street artist TUK is her great empathy by which she chooses locations for her lovable and sometimes socially critical paste ups. It is sensitive interaction of art and urban surrounding, which passers-by happen to experience. Only both, the right spot and the site-specific art complete overall impression. 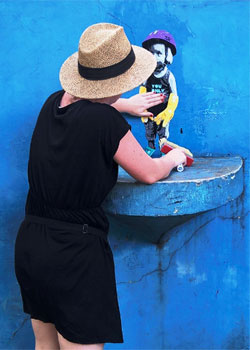 TUK likes being abroad and therefore, her catchy stencils are well-known worldwide. 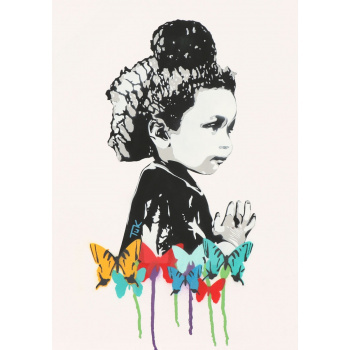 Her butterfly-girl is based on a real life encounter with a little girl from the Bastimentos island in Panama. The artistic realisation presents translated reflection of this peaceful Caribbean island with its typical biota. Thus, TUK brings us parts of that world into our world and thereby leaves not only an artistic imprint but also an enlivened image. TUK lives and works in Cologne.